Honda have taken the Goodwood Festival of Speed 2018 by storm! Key in their success was their brilliant events team, brand ambassadors and the Honda and Goodwood teams - all offering unwavering support! 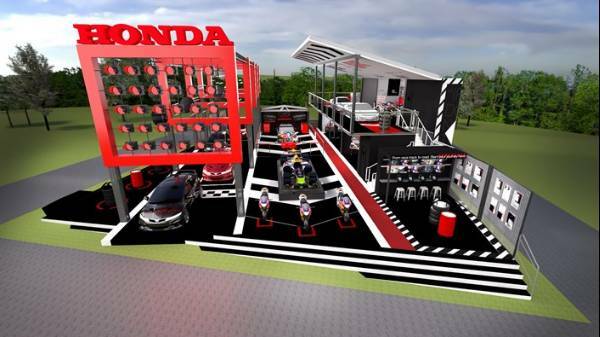 Honda has a massive foothold in racing heritage, and the Honda stand reflected this! The stand successfully brought to life the sporty image that Honda is so proud of. Take a look for yourself at the video below where Honda’s MD Dave Hodgett gives you a look at this years theme! As well as the eye-catching presence of the sporty stand, visitors also enjoyed some really impressive demonstrations of team Honda’s skills and prowess. The BTCC, BSVB and Synchro Motorsport teams gave some really impressive live demos. Honda went above and beyond to show how everything they learn on the track goes into all their road products! What better way to learn about improving vehicle performance than on the track?! Without a doubt the highlight of the day for Honda was the famous hill climb! Over the four day event this was definitely one of the standout events. The 2009 Formula One World Champion Jenson Button drive the iconic 1968 RA301 F1 car up the famous hill climb on the Sunday. This was followed by a hugely popular Q&A! Spectators were also lucky enough to see the RA301 F1 car! The NSX supercar was taken up the hill Nick Robinson, one of the leading engineers. And, to top it off, attendees were lucky enough to witness the British Touring Championship (BTCC) Civic Type-R cars, British Superbike (BSB) Fireblade motorcycle and even the 150 mph Mean Mower successfully tackle the hill climb. The Goodwood Festival of Speed has been going now for 25 years and Honda have supported each and every one! For a quarter of a century they have been part of this annual celebration of motorsport and car culture! So, to sum it up… Honda smashed it as this year Goodwood Festival of Speed 2018! A true reflection of their engineering success. Why not take a look at their track inspired road range here. Here’s a round up of all the highlights!